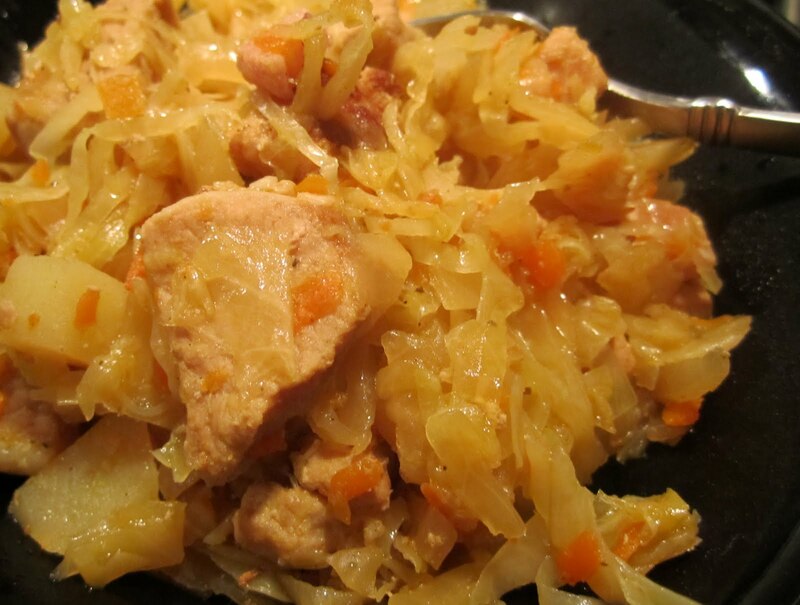 Many consider bigos to be a Polish traditional dish, though its origin could be probably traced to Germany. Those who happened to visit Germany might remember something like Berlin Platto dish served as sour kraut and different meats, accompanied by a pint of beer. Maybe that's why it sneaked into our family's list of recipes - I had a nanny who was German and introduced us to some of her recipes, and now I can call bigos Russian traditional food. My recipe for bigos formed over the years by trial and error. The simplest way to do it is just with meat, onions, and sour kraut. Once I had raw potato leftovers and, as a prudent housewife, put them to my bigos. It was so good that I've been doing it this way since then. Then I decided to add some fresh cabbage to it and it also became a must for my recipe. Enough talking though, let's do it together! Saute meat in oil until slightly browned, add onions, potato, bacon, pepper and salt. Continue to saute until potato is half done. Add sour kraut, sugar, and barely cover with boiling water. Simmer until meat is just a bit undone, at this point add fresh cabbage, and cook until it's soft, but not completely dead. Taste for salt, add more if needed. Serve with rustic bread and beer. In addition to pork and bacon, different meats could be used. If you have franks or sausage, add some to your bigos, it will make the dish more interesting. Actually, that's how it is done in some European countries. It is a matter of personal taste and tolerance to sourness of sour kraut, to rince or not to rince before cooking. Try it both ways and see what works for you. I have another version of bigos where only fresh cabbage is used. I can assure you it's very good (personally I like it even more than the original). Green fresh cabbage works best with this version. Cook lean pork until it's done, add cabbage, and do not overdo it. It makes a delicious spring or summer dinner. I have also a lazy bigos version, where franks or lean bacon (Canadian style) are used instead of pork. You can do it both with sour kraut or fresh cabbage. When you do it with fresh cabbage, the preparation will take you about 20 minutes. It sounds very attractive for a busy person, doesn't it?